Just as I got up today, everything started to sway around. I was feeling the strong 7.0 earthquake that struck just a few kilometers from Norcia. One text I received said that it was felt as far away as Salzburg, which is along the same fault. There was an aftershock of 4.3. I sent a text to a friend in Norcia, but I haven’t heard back yet. Is there a volcano along this fault line? Frequent tectonic activity might awaken any dormant volcanoes along the fault. 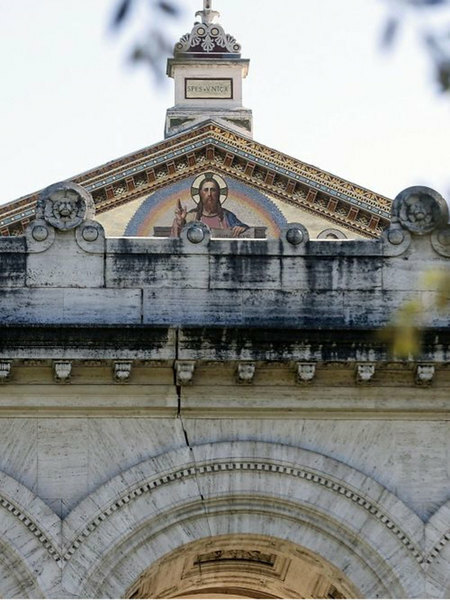 Prayers … And, later today, I will ask the local contemplative Carmelite community to pray for everyone involved (I do not know how quickly they normally receive news). Lord have mercy…I read in an AP wire report of how firefighters were asking a priest in Norcia to assist in calming the people, saying that prayer would help. It is good that the monks are there. I am praying for them. I am about 200 miles away (NE Italy) and my whole house shook. I immediately turned on the TV news and there were pictures of Monks running to all parts of the town with violet stoles on. Both of these earthquakes threaten the heritage that St. Benedict (and Pope Benedict) left to the church, each in their own way. The physical devastation of the geological one points to the much more serious devastation that the spiritual one threatens. Thank God no one was hurt and only a few were injured. Tragically nature writes once again, on the heartland of the Church, an event analogous for what transpires in the Church Universal. i was thinking something similar. Yes there is. There is a super volcano that is due for another eruption of biblical proportions that would wipe out Rome. Italy sits on a zillion faultlines. 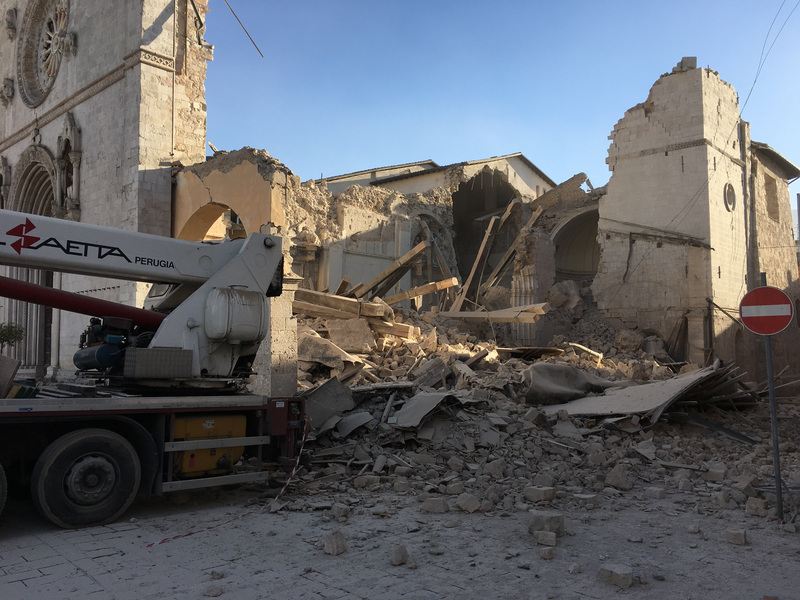 There has never been a century in the Church’s history when there hasn’t been at least one devastating Italian earthquake that flattened houses and cathedrals alike. This isn’t even the first time that Norcia’s been flattened. Every bad natural disaster calls us to penance, because it is in the nature of a wakeup call and memento mori. But bad disasters are allowed to happen on Earth because of the sin of Adam, not the specific sins of Joe Bob, Obama, or Francis. We do not have the pagan Irish concept of everything bad happening being due to the land revolting against an unjust king, just as we don’t sacrifice horses. Emotionally it’s a tempting idea; but it’s tempting because it puts all the blame on somebody else. If you study the lives of the great evildoers of history, rarely do they get smitten by God’s wrath or any natural disaster. As I think St. Irenaeus points out, God tends to preserve them in order to show that they have had every opportunity for penance, and to give them the joys on earth that they will never have in eternal life. Unless one has the gift of knowing souls and prophetic knowledge of God’s specific will in an instance, it would be better to blame Pope Adam I of Eden, or all of humanity, or oneself, for natural disasters. What we ought to do is pray and give alms to Norcia and Italy, and especially to the religious communities like the monks. It’s a great responsibility to try and be Christ’s presence in the midst of disaster, when you yourselves have lost everything. Only Christ, and help from the rest of the Body of Christ, can make that burden lighter. Is there a volcano along this fault line? There are many, including Etna and Vesuvius. As a sign of how common earthquakes in Italy are, St. Philip Neri once calmly continued saying Mass during a small one in Rome, and was later asked if he’d realized an earthquake was occurring. He said he had known, and that he figured that “The earthquake had been saying prayers for the old woman” for whom the Mass was being offered. Seismologists figure that these earthquakes are “filling the seismic gaps” that haven’t been filled since the 1703 Apennine earthquakes in exactly the same places. Here’s a detailed seismological analysis from August, pointing out that the August Norcia quake was caused by the 2009 L’Aquila quake. Another detailed posting from October 26, pointing out that the little earthquake then did not cover all the “seismic gaps” they had talked about in August. Apparently not. Here’s a blogpost and picture of all the little quakes on October 30, as well as the big one, from the Italian seismologists. Hopefully this has cleared things up, instead of making more pressure. There are few examples of this motto more obvious than in the history of Benedictine monasticism. Indeed! It can’t be a coincidence. The Church has suffered so many tremors recently. I hope the papal meeting with the Lutherans tomorrow in Sweden doesn’t turn out to be another quake. Perhaps this is a good indication that we should bring back Rogation Days. Weren’t the minor Rogation days begun as a response to several earthquakes in Europe? Our prayers are with the monks and all who have suffered in and around Norica. Thank you for the link to help the monks rebuild. I will forward it to our email lists. rtjl and Benedict Joseph, you “took the words right out of my mouth”! It’s heartbreaking to see this picture of the basilica, but yes, it seems to represent what is happening in the Church, and the world. Not an accident that this devastation is in beloved Italy, which I think of as the heartland of our faith. God bless and comfort the monks and all affected. We must never forget that st. Benedict is the one who is founder and patron of Christian Europe in the real sense and truly meaning, thus with an emphasis on “Christian” Europe. Shall we see this as a sign? Yes. Saint Benedict pray for us! Suburbanbanshee: Nota bene — I said analogous. Is Someone trying to get someone else’s attention? As 2017 comes rushing towards us at 100+ MPH. We are spinning out of control. In an age of unsurety we have the Holy See providing more, not less, of this unsurety. Amen to the prayers said here and everywhere for Italy, Norcia, and all the affected areas and people. I hear what you’re saying, Suburbanbanshee, and one moment I agree with your sound reasoning and the next I am sure that because of the unique nature of our times and what is going on in Rome, these lightning bolts and jolts of the earth are messages from God, even warnings. This is the time of blood moons and earthquakes and all manner of things that yes, we have them in some sense all of the time, but can anybody doubt that God is going to be heard at some point in this? Can what we are seeing in our world and the church go on forever? As far as I can tell there is no historical precedence for what we are experiencing in the church. Sinners are always in abundance, but our church has not experienced such an upheaval since the Reformation. I am astounded by what is happening in Lund tomorrow, and the timing of these earthquakes. I do not believe this is coincidence. Just sent the good monks some money to aid in the rebuilding. Sadly, chances are there will be more earthquakes, there’s no telling when the faultline will finally settle again. A reminder for those in Europe: the monks do have the details for a direct bank transfer (i.e., their IBAN) on their site if you dig a little deeper. If you’re in the eurozone, that’s probably better, otherwise one risks an unnecessary conversion to dollars, and basically get fleeced twice on the exchange rate. Could it be caused by St. Benedict rolling in his grave? May God watch over them and keep them safe. Kathleen10, this is like the olden days when bishops went on the lam! So then, what was causing it in 1703, when there were more deaths and more destruction? You got something against Pope Clement XI? The bull Unigenitus was bad, and Jansenism was good? Expanding the Feast of Our Lady of the Rosary to the whole Church was bad?